We’re thrilled to announce that Laurie’s biggest event of the year is on the horizon. 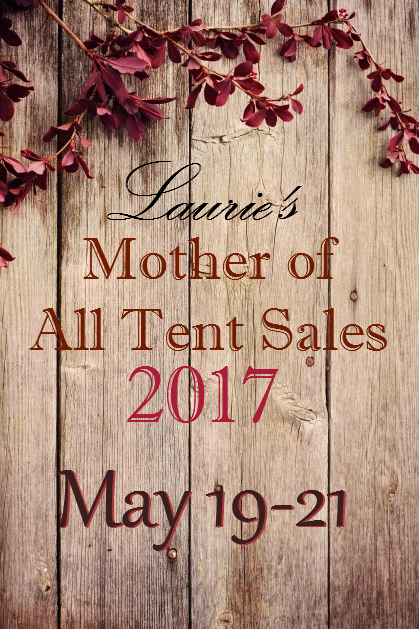 In honor of Mother’s Day, we’re bringing you Laurie’s Home Furnishing’s annual Mother of All Tent Sales! Yes, every year we bring out the best stuff with the best bargains to bless the best people on the planet – our mothers. That means if you are a mother, if you have a mother, or you know a mother, this sale is for you! So, take out your planner of choice and get these dates on your calendar pronto! This year, we’ve got two massive tents to double the excitement as well as two ocean containers stuffed with overseas merchandise that’s to die for. Now, the sale is a total dream, but parking a nightmare, so you’ll want to come early and stay late. All purchases must be shipped or picked up by Sunday night. The bulk of our sale items are one-of-a-kind, once-in-a-lifetime-opportunity buys, and it’s first come, first serve, so don’t sit on your caboose! Make your way to Laurie’s for the most spectacular sale of the year! And don’t forget to check back here for up-to-date news on Laurie’s latest.